For almost all of console gaming history, a game’s graphics were written in stone. Barring remakes and re-releases, Mario 64, Final Fantasy VII, Chrono Trigger, etc, look the same to everyone playing. Unlike PCs, where visual fidelity correlates strongly with your rig (and wallet), consoles democratized the gaming experience. The PS4 Pro and Xbox One X change all that. For the first time, console gamers have the option to play the same games with better graphics within the same generation. But by the same token, they are also proof the traditional console cycle, predicated on dramatic jumps in visual fidelity, is on the way out. The Pro and X allow developers to enable graphical enhancements for existing games. These high-end console offer advantages like higher resolutions, faster load times, prettier visual effects, and/or better frame rates. That’s all great, of course, but you have to pay an extra $100-$200 for the benefits. Better graphics are nice, but it’s a slap in the face to people who recently bought the “low-end” consoles and can’t afford an upgrade. Consoles are supposed to ensure a consistent, equal experience for everyone involved. The Pro and X separate gamers based on what they can afford. Few people own 4K HDR TVs, so the improvements aren’t as dramatic. The PC Master Race people will tell you that if you want the best graphics, you should build a computer – never mind the fact that consoles offer better bang for your buck. There’s merit to each of these arguments, but I think they misunderstand Sony and Microsoft’s ultimate game plan. In fact, I suspect it’s the opposite; there’s a reason Sony and Microsoft require developers to make any future games compatible with all versions of the PS4 and Xbox One. Basically, the existence of the PS4 Pro and Xbox One X have the side effect of showing that you don’t need the most powerful games available to play the best games available. After decades of console wars over x-bits and whatever-flops, that’s a big deal. It’s also not entirely surprising, because leaps in graphics just aren’t what they used to be. Fighting to improve graphics is a game of diminishing returns. Just look at how graphics have evolved over the years: The jumps between generations from the 8-bit era all the way to the Xbox 360 and PS4 were pretty dramatic, but to PS4 and Xbox One, less so. And yes, I know most people who regularly reads tech blogs can tell the difference between a PS3 and PS4 with ease, but your average consumer without a side-by-side comparison? I’m not sure. Of course, those are largely anecdotal observations, but I’m far from the only one who feels this way. It only stands to reason that the closer consoles get to photorealism, the less we’ll notice differences in each subsequent update. In fact, Nintendo stated this very reason for why it stopped bothering to compete on graphics with the Wii. Judging by the Switch’s sales – a console which is only about as powerful as the 10-year-old PS3 – that was the right choice. That’s why I’m happy with the approach Sony and Microsoft are taking now: They’re giving gamers a choice. Not all gamers care about the highest resolution and prettiest effects. Most ‘only’ have 1080p TVs. These are the people who just want to play the best videogames available at the time, and for them the Xbox One S and PS4 Slim will suffice. Graphics matter, but aren’t worth an extra benjamin or two. Meanwhile, the people who do have a 4K TV, want to prepare for VR, and/or truly care about mildly improved visuals can go ahead and buy the ‘luxury’ consoles. I am one of those people, and so are many of you reading this. If anything, the Pro and X are likely to extend the life cycle of the PS4 and Xbox One on the whole. Because Sony and Microsoft demand all new games are compatible with every version of the console, it assures the older ones will receive new games for several years to come. That’s much better than forcing gamers to pony up for a new console in 2019 that will likely provide a diminishing improvement in visual fidelity. Everybody wins. With these intermediate consoles presumably extending the eighth generation, it’s hard to predict when we’ll see a PS5 or Xbox Next. It’s clear console generations aren’t as sharply defined as they once were, but that’s a good thing: it’s an opportunity for the big gaming companies to rethink how consoles are upgraded. 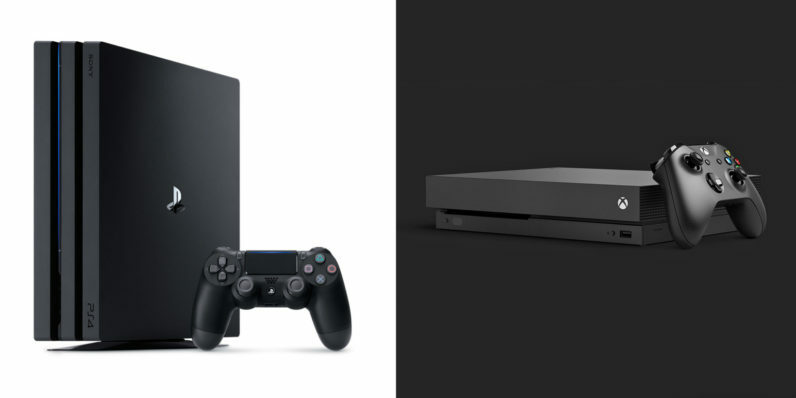 Here’s a thought: Instead of the usual 5-7 year gap, Sony and Microsoft could release consoles every 3 years or so, but retain compatibility between more generations. That would keep the graphics fiends satisfied, while allowing everyone else to upgrade at their own pace. Think of it kind of like the iPhone cycle, in which numbered releases are alternated with ‘S’ models (analogous to the Pro and X). Like iOS updates, games would remain compatible a generation or two forward, so you aren’t forced to upgrade with every model. When compatibility is broken, it would preferably be because of some major move in gameplay mechanics, not simply graphical horsepower. That would give users a bit more flexibility in choosing a console powerful enough for their needs, without being as complicated or expensive as building a PC rig. Considering the lack of major gameplay advancements in the last generation and the diminishing returns on graphics in the years to come, that only seems fair.